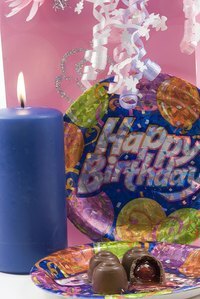 If you're in charge of organizing a 33rd birthday party for a friend or loved one, you may wonder how to create a party theme and decor that celebrates this age. Using the guest of honor's favorite things, as well as the number "3" can make the party an enjoyable event that guests will talk about for months. Choose the guest of honor's three favorite things in various categories and use these elements to decorate the party space. For instance, if his three favorite colors are red, black and white, use these shades for all the decor, including tablecloths, place settings, the table where food is served, streamers, balloons and confetti. If the birthday girl loves Italian food, ask other friends and family what appetizer, main course and dessert she loves the most, and feature these items at the party for all the guests to enjoy. This is a great way to include the number "3" in your party plans, and create a celebrate that is customized for your loved one. You can even create party favors in groups of three to send home with guests, such as three mini desserts wrapped in the decorative paper of the party colors. Do a little research to find out what special events were happening in the world 33 years ago, and frame some mock newspaper articles to feature in the party decor. Of course, you can also make the guest of honor's birth newsworthy, and create a headline with the birthday boy or girl's baby picture. You can feature enlarged photos of models and celebrities displaying the fashion and style that was popular 33 years ago, and play music at the party from the year the person was born. If the party is an intimate gathering with people who know the guest of honor well, you can request that people contribute to a joint gift of a large basket filled with 33 small items that the birthday girl will love. These can include a book about how to survive the 30s, a gift certificate for a day at the spa, or small tokens such as the guest of honor's favorite candy or snack. You can also take time in the party to let all the guests write down 33 things they like about the birthday girl, and give each of them a chance to share what's on the list. A small gag gift, like a noisemaker or party hat, can be given to the guest with the most entertaining list.